PT-04 �쇰㉧���몃�� 2014�� ���� 200 ��履쎌�� ���곗������. �� 釉���踰��� 諛��щ��援� �⑤�⑥���� �����댁�� ��媛� ����嫄� ��濡�瑜� �곕�쇨�����. ���� ��濡��� 援��� �쇱�≪�� �쇳��湲� ���� ��媛�怨� ��泥��� 嫄곗� �⑦���곗�깆�쇰� �ν�⑸����. �곗�� ��援ш�吏� �щ�� 泥ル�吏� 湲곗����� 留��댄�⑸����. ��履쎌�쇰� 怨��� 媛��ㅺ� �댁����� �쇱そ�쇰� 爰얠�댁�� 寃쎌� 醫��� 342踰� ��濡�瑜� ��寃� �⑸����. 臾쇱��媛� 怨듭�� ��援ъ�� ���� �� 踰�吏� 湲곗��� �대�⑤�� ������ 吏��� �ㅼ������ 媛�蹂��� �곕�� �� 硫�吏� ����嫄� ��濡�瑜� ��怨� �����쇰� 怨��� 吏����⑸����. �� 踰�吏� 湲곗����� �⑸Ц�� 吏����� 遺�履쎌�쇰� 諛⑺�μ�� ��由щ㈃ 怨�媛��ㅼ�� ���ㅺ�, ��由��ㅼ�� 341踰�怨� 345踰� ��濡�瑜� ��怨� �� 踰�吏몄�댁�� 留�吏�留� 湲곗����� �ㅼ��硫댁�쇰� �ν�⑸����. �� �������� 援ш������� 湲멸��� �щ�� ���� ���밸�ㅼ�� �곕━�� 諛�湲몄�� �≪�� ������. �ㅼ���� 吏������� 留��대�ㅼ�ㅻ갭由ш낏���대�쎌�� ���� 怨�媛�瑜� ���� �ㅼ�� 86踰� ��濡�瑜� ��怨� 遺���媛��쇰� �ν�⑸����. �⑥�� 援ш��� ��媛� 遺��⑥�� �곕�쇨��� �ъ�� ��吏�湲몄������. ���� ����嫄� ��濡�瑜� �댁�⑺�� 二쇰� 援��� �쇱�≪�� �쇳��怨�, 諛��щ��援� �⑤�⑥�쇰� 嫄대��媛� 異�諛�/��二� 吏����쇰� �����듬����. The PT-02 permanent is the legacy of the Seoul 200K-east brevet of 2014 and starts on the south side of Banpo Bridge along the Han River Bike Path. 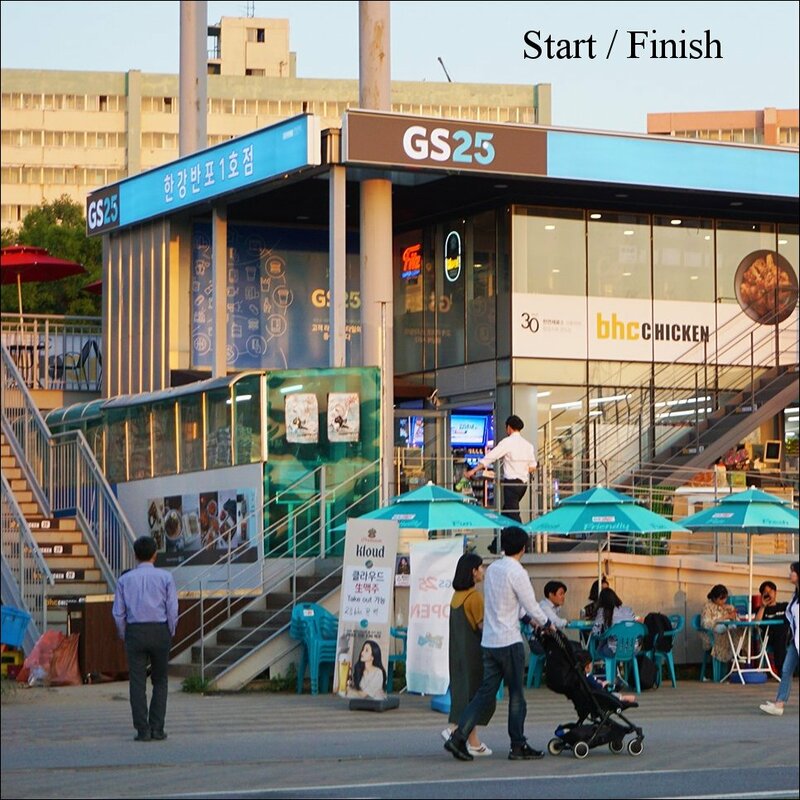 We avoid Seoul traffic via the Han River & Tancheon paths and continue towards Namhansanseong. After a climb to the fortress entrance, you will have the first control. Continuing east we turn left at Toechon and ride via the scenic Route 342. At the 'tomato village' Murangae is the second control, after which we continue our ride over excellent bike trails along the river toward Yangpyeong. After passing through Yongmun, our third control, we turn north and head for the hills via the lovely Routes 341 and 345 to the little town of Seorak, our fourth and final control. Country style restaurants with a variety of superb Korean cuisine will tempt us along this challenging stretch. After leaving Seorak, we climb and pass along the Midas Valley golf link and join route 86 towards the Bukhan River. 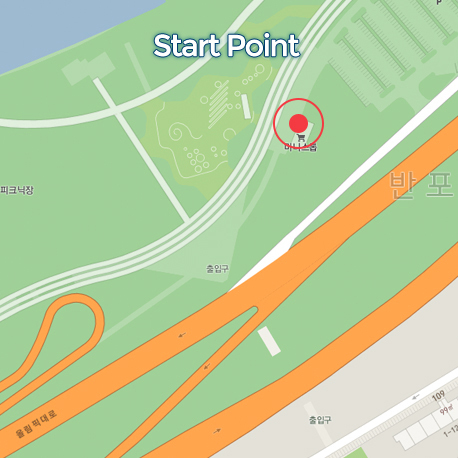 The remainder is an easy flat stretch along the north bank of the Han River. Once again, we use the bike path to avoid weekend traffic and return to the start/finish point crossing to the south side of Banpo Bridge.